Founded in Los Angeles, California in 1988, Trend Micro is a Japanese multinational cyber security and defense company. This company develops antivirus software for servers, cloud computing environments, consumers, and business enterprises. 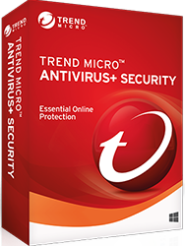 Trend Micro offers three consumer-based antivirus products that provide a plethora of features. Although, the half-screen interface of Trend Micro is not resizable, it can be moved around the screen. The 300MB installer performs system scans and checks for compatibility. You can either go for the trial version which is available for free for 30 days or enter the license key that comes with the CD. Once it gets approved, it takes approximately 15 minutes to install and setup the complete software. The user interface has a grey and white background scheme with a large circle in the middle that denotes the security status of the system. A green circle indicates that your system is safe, while a yellow circle indicates that it needs to be quarantined, and a red circle denotes that it has been compromised. You can also choose to manually scan your PC or opt for an automatic system scan once the system starts. – Trend Micro offers three types of antivirus security—Trend Micro Antivirus+ Security, Internet Security, and Maximum/Premium Security that supports 1, 3, and 5-10 devices respectively. While all the three variants of the antivirus software are supported by Windows 7 through Windows 10 operating systems, The Internet and Premium Security variants can be bundled with other platforms such as Mac and Android, Mac, and iOS respectively. Compatibility with multiple platforms is one of the popular features that is offered by some of the most top-notch antivirus brands. – The features of the Antivirus+ Security variant of Trend Micro include anti-spam, firewall booster, and ransomware protection. It provides a single user license for a price of approximately $40. The Internet Security variant includes features such as the file shredder, system optimizer, privacy scanner, parental controls, data theft shield, along with the three other features that are offered with Antivirus+ Security. Priced at around $80, the Internet Security variant can be bundled with Mac and has a multi-device license for three devices. – The Maximum/Premium Security is cumulative of both the variants and offers extra features such as file encryption, password manager, secure browsing, and cloud storage scanner. This variant offered by Trend Micro can be bundled with Mac, Android, iOS platforms and offers a multi-device license for 5–10 devices. Based on the number of devices, the antivirus is priced between $90 and $100. Trend Micro offers real-time antivirus protection and blocks malicious URLs and provides protection against your social networking sites being compromised. Like many antivirus software, it performs heuristic checks for software that are being installed in the system. It also gives the user the ability to protect specific folders from system threats. One of the distinct protection layer offered by Trend Micro is that it flags a website in real-time based on its authenticity. This helps the user avoid malicious activity on their system before even before entering the website. The firewall booster strengthens the operating system’s built-in firewall by monitoring suspicious traffic and adding protection against the botnet activity. It also adds a layer of security where it helps the user block objectionable material and limit screen time to curb the use of the computer system. To limit the use of a computer system by impressionable users, it allows you to block selected applications. None of the antivirus variants offer a separate browser for online banking and purchases. However, it does offer a virtual encrypted keyboard that safeguards your password from malicious agents over the Internet. As a stand-alone application, Trend Micro offers a password manager that works for Windows, Mac, Android, and iOS devices. The antivirus does not offer webcam protection which can also be a cause of concern in case of identity theft. Trend Micro offers an anti-ransomware module, Folder Shield, as one of its features where it blocks unknown programs from accessing the system’s contents. This extra layer of protection helps in blocking current and brand-new discovered threats. The antivirus doesn’t mention it as one of its salient features; however, it offers an anti-spam feature to block out emails with questionable content and poor credibility. However, it only works with email services that use POP and SMTP protocols. Trend Micro’s malware detection engine can have a considerable impact on the system. Running other applications can take longer when the antivirus is scanning the system in the background. Trend Micro offers a user-friendly interface with a plethora of features. Your system might slow down a bit, as it provides one of the most popular anti-malware engines to protect your system against the worst malware lurking over the Internet. Trend Micro could be the right choice if you are looking to protect as many as 10 systems at a reasonable price. To make sure Trend Micro is the right choice for you, you can choose to opt for the 30-day trial and get a first-hand experience of the software before finalizing on buying the whole package.